Every time I’m “home”, I’m amused as I travel around the city like a “tourist” to places I’ve known since I was a young boy. I make my way to Stanley Park, which as an urban green-space expanding out to 1000-acres is one of the largest and most scenic city-parks in the world. A well-visited spot for locals and tourists alike, Prospect Point offers on a clear day a spectacular view of the mountains on the North Shore, English Bay and the Gulf Islands to the west, and Burrard Inlet and Burnaby Mountain to the east. 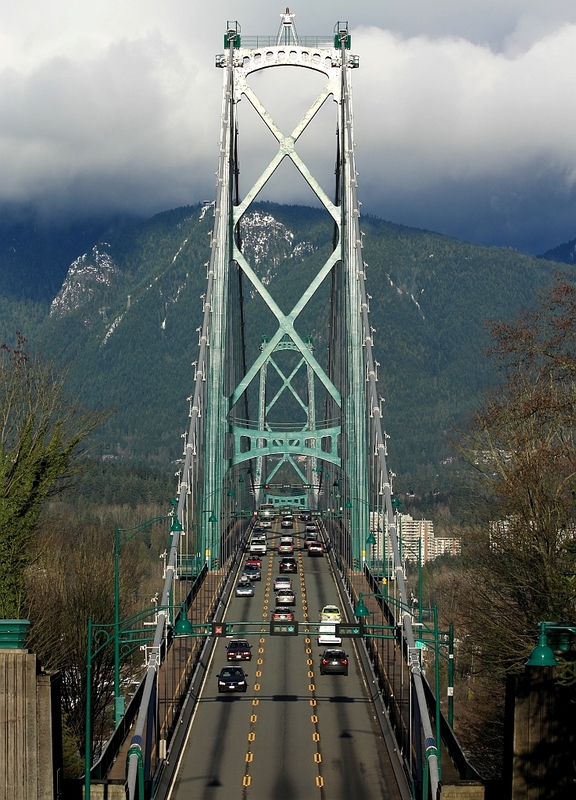 The Stanley Park Causeway bisects the park in half, and leads directly to the Lions Gate Bridge. Over the Causeway at Prospect Point is a small overpass, where statues of lions stand, noble and proud, their serene gaze a hint to the beautiful sight across the way. 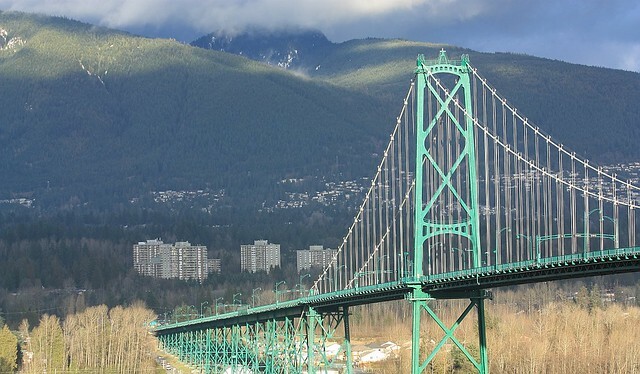 Although there are a number of bridge crossings throughout the metropolitan area, the Lions Gate Bridge is an important well-photographed landmark and icon of the city. With the direct financial backing of the Guinness family (yes, the one and the same Guinness), the bridge was built in 1938 to cross over First Narrows and to provide access from the city proper with the growing residential development on the northern shores of Burrard Inlet (Salish Sea). Ever since I was a boy when dad drove us over the Bridge, the colours have always remained, burned into memory. I think dad loved bridges, and I suspect he loved the view, too. Blue patches between clouds, and in the waters of First Narrows below. I want you to imagine you are driving north, across the Lions Gate Bridge, and the sky is steely grey and the sugar-dusted mountains loom blackly in the distance. Imagine what lies behind those mountains – realize that there are only more mountains – mountains until the North Pole, mountains until the end of the world, mountains taller than a thousand me’s, mountains taller than a thousand you’s. Here is where civilization ends; here is where time ends and where eternity begins. Here is what Lions Gate Bridge is: one last grand gesture of beauty, of charm, and of grace before we enter the hinterlands, before the air becomes too brittle and too cold to breathe, before we enter that place where life becomes harsh, where we must become animals in order to survive. It’s hard to imagine Vancouver without “The Bridge.” And when I drink Guinness, I’ll raise my glass and cheer the family for building what has become a definitive landmark for the city. For views of the Lions Gate Bridge similar to the photos above, head to the western edge of the downtown peninsula and into Stanley Park, and make your way to Prospect Point Lookout at the northern tip of the park. I made the three photos shown above on 7 January 2011 with the Canon EOS450D camera, the EF 50mm f/1.4 USM lens, and the EF 700-300mm f/4-5.6 IS USM lens. This post is published on Fotoeins Fotopress on fotoeins.com as http://wp.me/p1BIdT-Mm. Ah! .. and the crisp zephyr / air.